Continuing with the theme of procedural toys: Adobe Labs has published a rather awesome toolkit for writing image process toolkits. Pixel Bender compiles a rather straight forward language into GPU code, and provides an interactive UI for tweaking parameters on the fly. The IDE stands alone, so you can play with filter writing without needing to host inside Photoshop or After Effects. Tom Beddard wrote some amazing plugins for it. His Fractal Explorer is a lot of fun to play with. 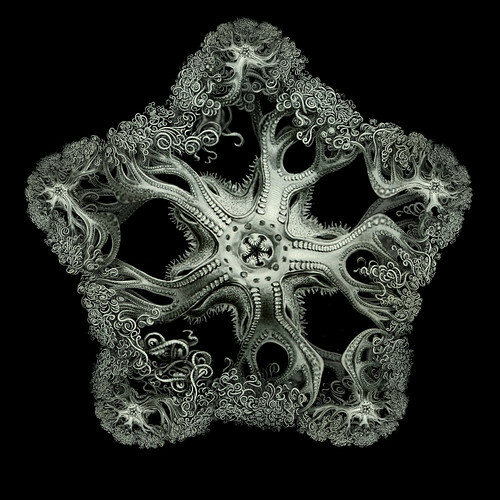 The image above is an Ernst Haeckel image applied to a fractal using orbit trapping.